When I create a card, I simply can't resist adding some sort of ribbon, lace or trim. 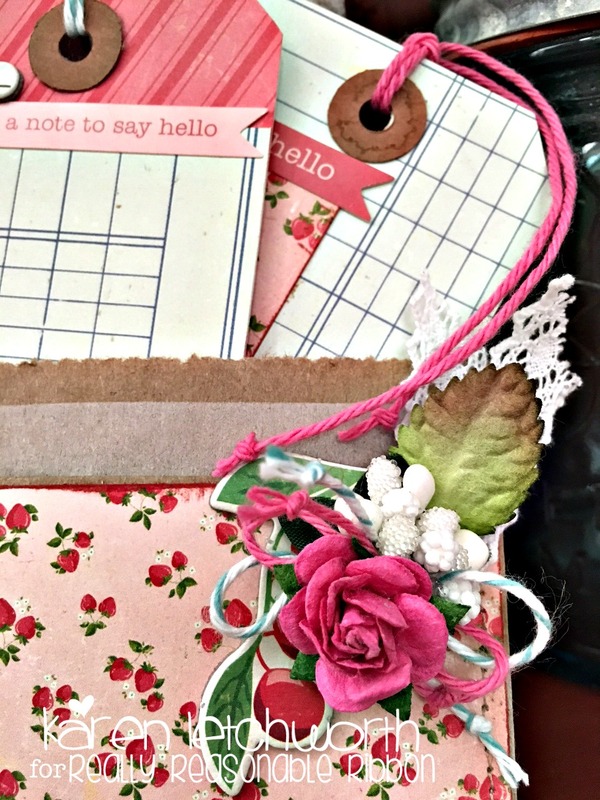 It just seems to be the perfect finishing touch, and by using my supplies from Really Reasonable Ribbon, there's always a perfect fit for every project. 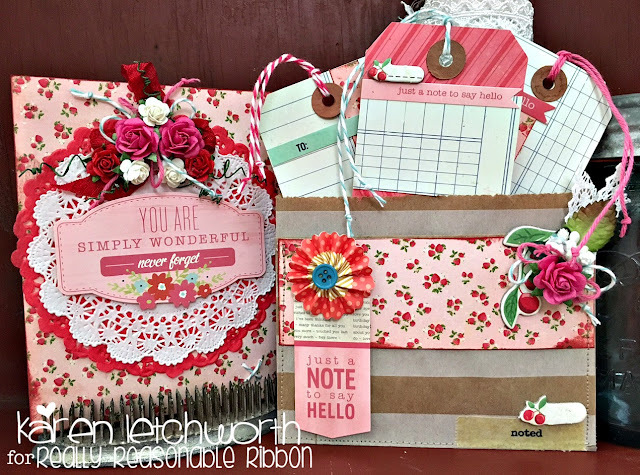 In this case, I created a card and matching pocket bag with tags; and adorned them with LOTS of great products from Really Reasonable Ribbon. 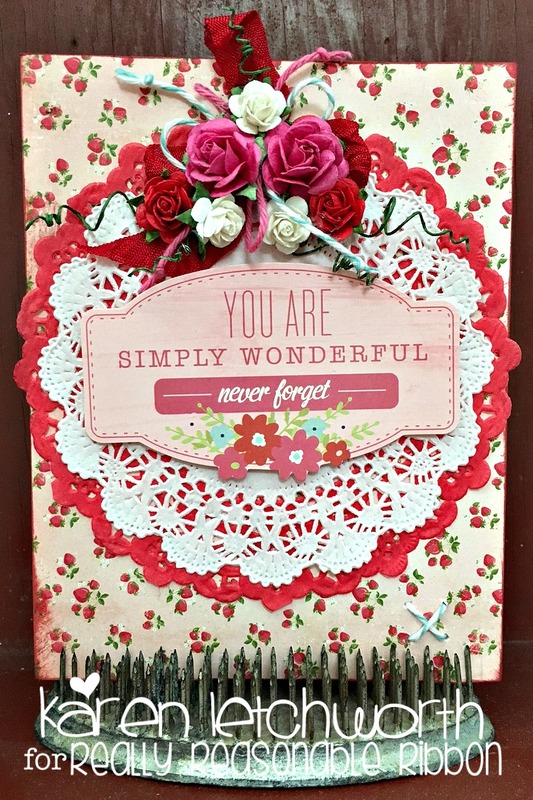 I used some pretty patterned papers, two doilies (red and white) that are layered, and sentiment stickers. At the top of my card, I added three bows, They were made using Lipstick Red Seam Binding, Teal Baker's Twine and Deep Pink Solid Baker's Twine. Then, I added in some of Really Reasonable Ribbon's FABULOUS Mulberry Flowers including their Deep Pink Open Roses, White Open Roses, and Red Open Roses. I created the pocket bag using one of Really Reasonable Ribbon's great Decorative Bags. ALL of our Decorative Bags are on clearance at FABULOUS prices. The one I used on this project is the Middy Bitty Bag With Horizontal Stripes. They are reduced to just $1.65 for 10 bags! What a bargain, and they're SO cute! 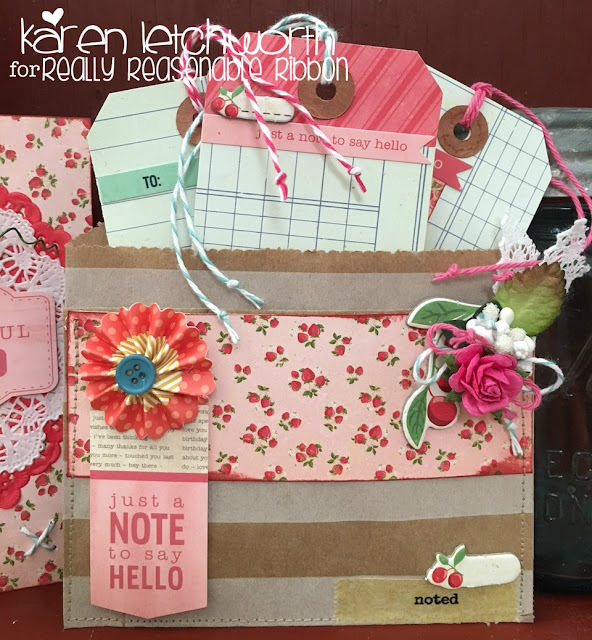 I added some matching patterned paper, 3-D embellishments, and more of Really Reasonable Ribbon's sweet embellishments; including a Wild Orchid Crafts Mulberry Paper Green Leave, a small cluster of White Gypsophila, and another beautiful Deep Pink Open Rose. For the three tags that I tucked inside the Pocket Card created from the Middy Bitty Bag With Horizontal Stripes, I simply covered some Grungy Prim Tags with matching patterned papers, added some stickers/sentiments, and then tied a length of Baker's Twine to the top of each one; including the sweet Raspberry Baker's Twine, Deep Pink Solid Baker's Twine and Teal Baker's Twine. They all work together so well and compliment one another. There's no "bad" or "wrong" combination of supplies when it comes to all the FABULOUS products carried at Really Reasonable Ribbon. But rather, just the PERFECT trim for everything! I hope that you will stop by to play along in our Current Challenge, stop by our Blog for daily inspiration, and then visit our amazing store to do some shopping. We love having you stop by, and you will be sure to enjoy your visits. So, have a great week creating all your projects; and we will look forward to seeing them all. Very pretty, love your mix of colors and ribbons.